Well it has been a little while since we published a recipe and folks kept asking for more. Today’s recipe is sure to be a crowd pleaser. 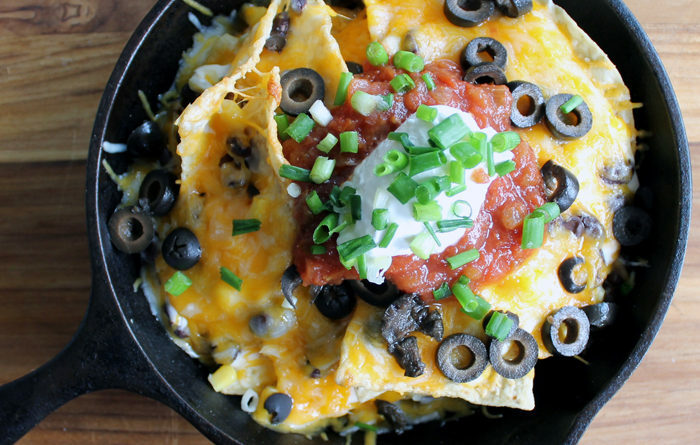 Nachos made over a fire with a cast iron skillet.I don’t know about you but nachos always make me happy. They are also a good source of energy, and with the right toppings can be a balanced meal. If you chose to use meat on your nachos you need to cook and prep that first. I cook the chicken in the skillet until tender enough to shred. Use beer or other substance to deglaze the pan and begin the nacho prep. Layer your chips in an iron skillet. Scoop on nacho cheese or your favorite brand of cheese dip. Add any ingredients that you would like to be warm when the dish is complete in the next layer. I put black beans, corn and chicken in at this point. Then layer on as much shredded cheese as you would like. “Bake” near your campfire until the cheese is good and melted and the chips are nice and warm. Using the heat from a coal bed is the easiest for this. You get plenty of heat and you can move the skillet around to melt the cheese evenly.